If you really want to get a taste of Tahoe, drop a few extra dollars and treat yourself to fine cuisine at any one of these exquisite eateries. With so many VIP visitors, it's no surprise that the restaurants in Lake Tahoe hire many talented celebrity chefs. These famous food artisans have made their homes here and Lake Tahoe is fast gaining a reputation for culinary excellence. In general, reservations are required, and it’s more fun for everyone if you “dress” for dinner, but we think you’ll agree it’s well worth the extra fuss. Many of the restaurants in Lake Tahoe offering fine dining offer scenic views which makes sunset a great time to start your evening. If you're the apres-ski crowd then you'll need to hustle after the slopes to take advantage of the view. If you're the golf crowd, the sun will set later so after a martini on the 19th hole, you'll be ready to sit down to quiet night retelling your golf rounds. Both North Shore Lake Tahoe and South Shore offer cuisine prepared by celebrity chefs. You should call ahead to see who's in the kitchen cooking. Here is our list of recommended restaurants for your pleasures. 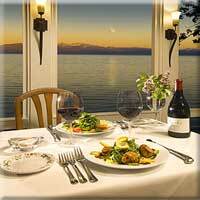 Beautiful restaurants in Lake Tahoe sit on the shores edge such as this at Christy Hill. Our favorite places to take someone special.